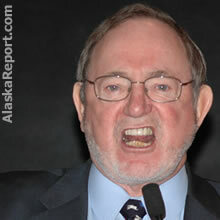 The second day of the Alaska Republican Convention had some fireworks - a raging Don Young, a surprise announcement, and a more pregnant-looking Sarah Palin getting multiple standing ovations. The day started off with a gutsy speech by governor Sarah Palin that went directly after the corruption that has plagued the Republican party in Alaska. "It's kind of, I think we have to acknowledge, it's sort of the big elephant in the room," Palin aimed at the ethically-challenged party head Randy Ruedrich. Palin and Ruedrich go way back to the days when they both served on the Oil and Gas Conservation Commission in 2004. Palin outed Ruedrich's corruption by using his office for Republican party business and leaking a confidential memo to an energy company lobbyist, among other things, and Ruedrich was forced to fork over $12,000 when he pled guilty to the ethics violation. "We can't kid ourselves there has not yet been restoration of the public's confidence in the Republican Party and we have got to do better," Palin said to a rousing applause. >>> See video of Young closing his eyes while Palin gave her speech. "I think we need to call on all of you assembled delegates to rise and, literally even, stand with me if you desire change in our party's leadership," Palin said as many in the crowd rose to applaud. Don Young sat in his seat with a smirk on his face. Don Young took the stage after Palin and launched a fiery speech. >>> See video of Don's speech. First up, rip Sarah Palin. "We do have a chance in this state and it's not words, it's development of our resources," Young said. "And this is direct criticism of my lieutenant governor and my governor at this time. We have to start investing it's not opening federal lands it's using our state lands." During the entire Frank Murkowski administration Young never once said anything like that about Murkowki's failure to open ANWR. Nor did he mention his failure after 32 years on office. Palin said her administration's team is working to develop the state's resources. "In the year that we have been in office we are doing all that we can to also unlock Alaska's resources so that we can develop and be more self sufficient kind of trying to make his job a little easier on him," Palin responded. The shocker of the day came when Lt. Gov. Sean Parnell announced that he is challenging Don Young in the August Republican primary. "I'm holding a press conference today to announce that I will be a candidate for the U.S. House of Representatives," Parnell said to gasps and applause in the audience. "For too long, we have expected too little from our elected officials," Parnell said. "It is time for change." "I just think it's about restoring trust to government," Parnell said. Saturday Ted Stevens and Lisa Murkowski give speeches. If you want to see it, officially it's a Republican event, but if you go to the Captain Cook Hotel and wander in, nobody will stop you. From TalkingPointsMemo.com: Your Daily Politics Video Blog: For two years now, we've been chronicling Alaska Rep. Don Young's (R) efforts to be involved in every major political corruption scandal of the last decade. And now that the political waters are rising around him back in his home state, he's gone on the attack. So here in today's episode of TPMtv, we bring you some of the choice mouth-foaming moments.